Besætningen på STI R9261 er mindet på dette monument rejst her nær nedstyrtningsstedet. Se også mindestenen i 2010. 8 flyvere. Se Lancaster fotos. "339 RAF bombers attacked Stettin on the night before 21 April 1943. The sky was clear, and the marking from Pathfinders was perfect. About 100 acres of the central part of the city were hit, and 13 factories and 380 houses were totally destroyed. 580 persons were killed in the attack. At the same time Rostock was attacked by 86 Stirlings. - All planes entered Danish airspace at Esbjerg. - 13 Lancasters, 8 Halifax and 9 Stirlings were lost." STI R9261 was attacked by a Me110 on the return flight from Stettin here and caught fire. See Korsør Avis about air crashes. Only Sgt (Flight Engineer) Donald V. Smith managed to bail out with his parachute. After the landing he walked across Zealand and reached Helsingør (Elsinore), where he was helped to evade to Sweden as the first allied airmen in the war! See Google Map Don's route. 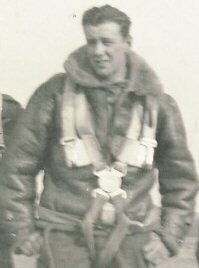 See Links for First Airman to Sweden A Letter and 3 telegrams. See also Don´s Diary.